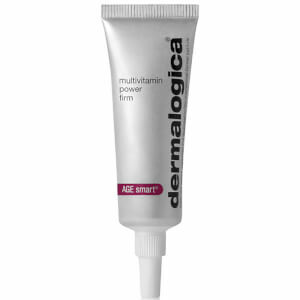 Dermalogica Multivitamin Power Serum is an age-fighting serum containing micro encapsulated vitamins A, C and E to help increase skin recovery, decrease fine lines and age spots while defending against skin aging. Boost elasticity levels with a skin-strengthening protein peptide that overrides biochemical triggers that lead to skin aging. Formulated without artificial fragrances and colors. Retinyl Palmitate encapsulated Vitamin A increases cell renewal and turnover. Alpha Tocopheryl Acetate encapsulated Vitamin E provides antioxidant benefits to the skin and helps reinforce barrier lipid layer. Ascorbyl Glucoside a stabilized form of Vitamin C that stimulates collagen synthesis to help fight signs of aging.